We provide Evaporative air cooler for all Dubai customers with free service and maintenance. Evaporative cooler cools air through the evaporation of water, differs from typical air conditioning systems which use vapor-compression or absorption refrigeration cycles. Evaporative cooling works by employing water’s large enthalpy of vaporization. The temperature of dry air can be dropped significantly through the phase transition of liquid water to water vapor, which can cool air using much less energy than refrigeration. In extremely dry climates, evaporative cooling of air has the added benefit of conditioning the air with more moisture for the comfort of building occupants. 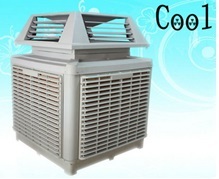 Now evaporative air coolers are widely used in different area. This Evaporative air cooler are so safe to use with superior safety standards. Will allow you to extend outdoor activities when the summer when the temperature going high. Evaporative air cooler will generate air stream to cool surrounding objects rather than the surrounding air, keeping you and your guests Cool. Cold air stream with powerful fan provides efficient evaporative cooling performance and uses less electricity while providing your customers ultimate comfort place. This Evaporative air cooler can be used also for warehouse, garage and shop spot cooling, on rental basis for outdoor wedding, banquets and other social events, our Evaporative air cooler add new dimension in comfort.